This map measures 1280 pixels wide by 1068 pixels high (file size is about 41K). Click on the reduced size image at right to open the map. Place names are labeled on the map. A map index is shown below. 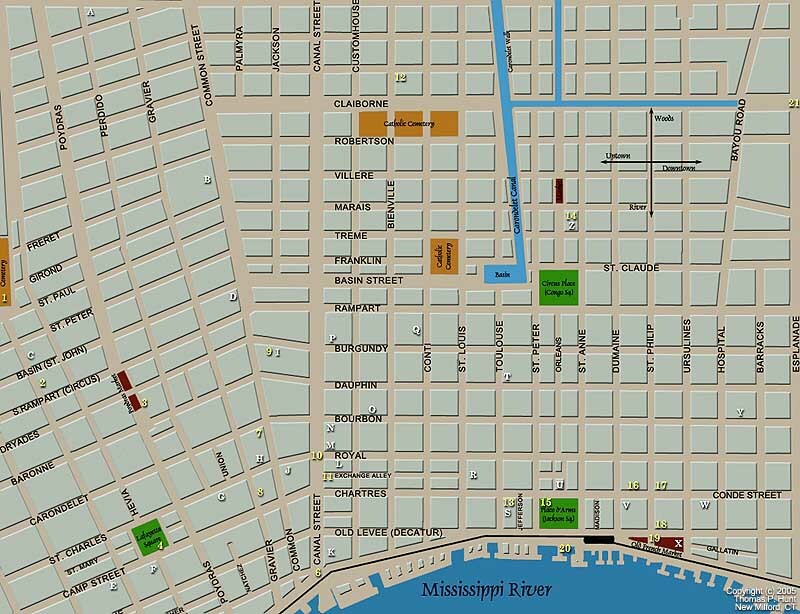 The full New Orleans map measures 800 pixels wide by 614 pixels high (file size is about 97K). Click on the reduced size image at right to open the map. A partial key referring to labels on the map is shown below. Police Chief David Hennessy assassinated late in the evening of Oct. 15, 1890. Shots come from across Girod Street. Grocer David Clark is caught in crossfire of gang battle and suffers mortal wound in March 1869. Joseph Agnello escapes assassination attempt in 1869. Metropolitan Police Chief Algernon Badger falls seriously injured during Battle of Liberty Place. Detective Devereaux murders rival Detective Harris in March 1876. Devereaux argues self-defense, claims Harris hired a Sicilian assassin to kill him. The statue of Henry Clay is the site of inflammatory meetings leading to the 1874 Democratic rebellion and the 1891 lynchings of captives at Parish Prison. Antonio Labousse is gunned down on July 15, 1881. Giuseppe Mattaino is found murdered on Feb. 24, 1889. Raffaele Agnello is shot to death on April 1, 1869. Parish Prison is the location of the largest lynching in U.S. history in October of 1891. Eleven Sicilian prisoners were shot and/or hanged. Detectives David and Mike Hennessy apprehend Sicilian outlaw Giuseppe Esposito on July 5, 1881. Palermo gangsters break into Messinian home and open fire at rivals on Feb. 15, 1869. Murder of Messinian Litero Barba on Oct. 28, 1868, initiates feud between Sicilian immigrants from Palermo and those from Messina. Messinian leaders Bananno and Allucho are cornered and killed at Old French Market on July 22, 1869. Joseph Agnello is trapped and murdered at Picayune Pier on April 20, 1872. Wagon carrying Matranga stevedores is ambushed by Provenzano gunmen in early morning hours of May 6, 1890. Created from a New York City fire insurance map, this East Harlem map shows locations of interest in the 1909-1915. Click on the reduced size image at right to open the map page. A map of Buffalo, New York, locations is hosted on the book website for DiCarlo: Buffalo's First Family of Crime. Click on the reduced size image at right to jump to the map page.